Growing up in the Highlands most of my childhood days were spent outside exploring the countryside and wildlife, gathering up an array feathers and stones that looked like little faces. 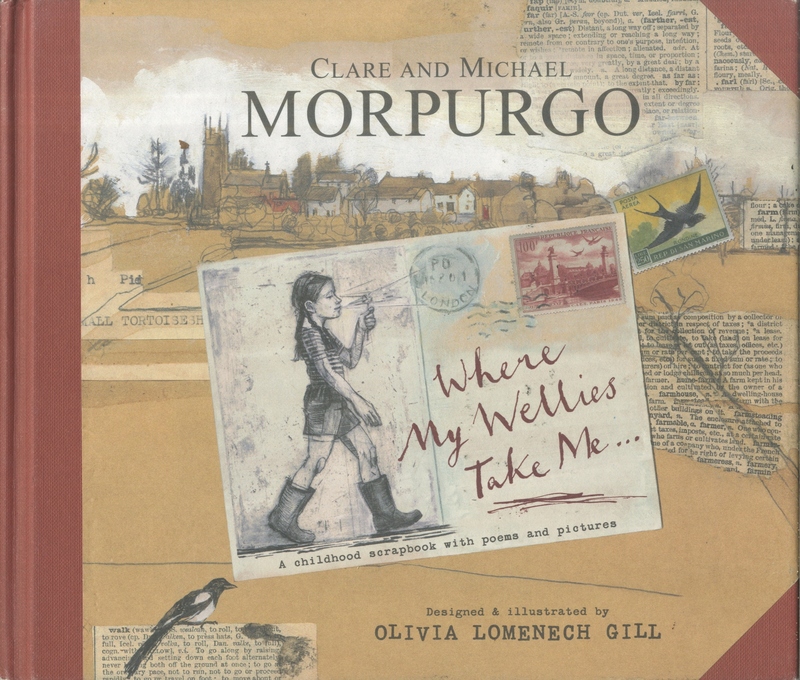 This is probably the reason why Clare and Michael Morpurgos’ picture book ‘Where My Wellies Take Me…’ is so dear to me. 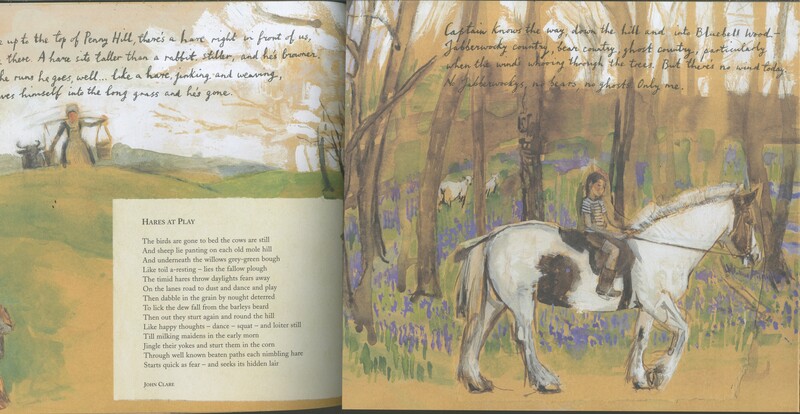 The book tells the story of Pippa, a little girl going for a walk in her wellies, observing everything she sees and making notes and sketches of her discoveries. Along with the narrative, the book contains a collection of poems which weave into the story as Pippa makes discoveries. Great care has been taken whilst creating this book. Everything from the endpapers to the paper quality has been thought out carefully. The hardback cover, along with the spine and corners being covered in book clothe, makes this book a very high quality and gives it the feeling of being a special item. Michael Morpurgos’ story is written from Pippas point of view. He includes childish observations and opinions, which gives the story a very innocent and friendly tone. It is written very simply but beautifully. The way the story changes subject and focus so often reflects a child’s attention span and creates a sense of nostalgia, like remembering small snippets from your childhood. Michaels’ sister Clare selected the poems from some of her favourite poets; Shakespeare, William Blake and Ted Hughes. They add another dimension to the book by expanding on what Michael has written. Olivia Lomenech Gill designed and illustrated the book. Each page is exciting in terms of composition, colour and subject. She uses a variety of techniques and materials to create a ‘scrapbook’ look, although it is very clear that each aspect has been considered carefully. Olivia uses collage in many of the spreads, which creates a lovely textured surface. I especially like the effect the newspaper gives. She also makes use of mono- printing for some of the sketches, but predominately uses inks, paints and pencil. The mixed media creates exciting textured illustrations which work perfectly alongside the text. Olivia also included fold- out pages, flaps and tracing paper layers. These features make reading the book a fun and interactive experience, and gives it that something extra. The story is written in handwriting and the poems in a computer font, which helps separate the two. The colour palette for the illustrations is perfect for the story. Olivia used muted and muddy colours to convey the countryside and used brown papers frequently. The book has a very natural quality to it through the colours. I think this book is aimed at older children as it is quite a long story and there is a lot of text per page. However a younger child could easily appreciate the illustrations and read the notes beside them. ‘Where My Wellies Take Me…’ is a really successful book as it is finished to such a high quality and all aspects of it have been carefully tied together. It is a charming and accurate account of a childhood growing up in the countryside and is even enjoyable for a nostalgic older reader like me. One of my favourite double spreads.